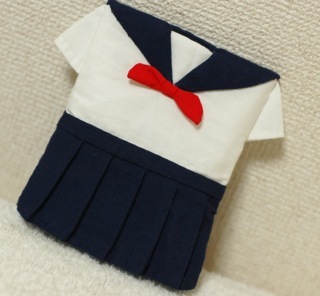 i love the sailor suit! it is very very cute! I want to thank you for writing your blog, i have not been at work to day as i am unwell and reading your blog, looking at your fantastic photos and just hearing of what you have been up to has made me feel a lot better. I also want to thank you for the brilliant origami ideas, ive recently started doing origami again and have had much fun making the ones you have. Keep up the fantastic sewing and traveling. I feel very happy to hear that. I also have no jobs recently and stay at home and sew every day. It's fun to make something by my own hands. I want to see your origami works. What's your email address and can send you some pictures, I'm still only learning so there nothing complex, last night i made Totoro, i was very pleased by how he came out, i also made some kind of sea fish and a wedding dress, my plan tonight is to make the kimono, but it will not be as pretty as yours as pretty origami paper is hard to find in England, i do my best with what I've got. i love your sewing, i think it is very very cute and wish i could come up with ideas like that. I just really enjoy your Blog and all the lovely things you make. I have ordered a couple of things from your shop but wish I could afford to buy lots more. Please keep sewing, your work is beautiful. I want to see your Totoro! My e-mail is "maimairuru(at)gmail(dot)com". I can send you some Origami papers and Kompeito! Thank you so much! I'll keep sewing and try to make better ones. you inspire so many with your talents! Always lovely things! Your works are so special! A Japanese surprise every time!! We're thinking of you two, too! Not, it's on Haru's desk. Love this. 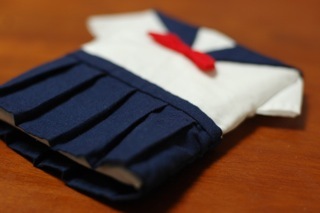 In my younger days, my school uniform was pleated. Our uniform was made of cotton and it was difficult to iron them too.